Be sure to test your luck with Exotic Helm Engrams! This marks the first time this unique shotgun has been sold! It’s much more viable in PvE now that shotguns have gotten a buff, and it really can make for some fun Crucible games. We have a full review for this weapon but the footage was taken before the most recent buff. It will take up your primary slot so you’ll need to consider the circumstances. The “Universal Remote” perk nearly doubles the range when ADS, allowing you to take people out from a safer distance. The stability is very high too which means you don’t need to worry about any stability boosting perks. In PvP it’s awesome in Rumble and smaller maps. If you enjoy getting up close and personal with your enemies, this is a great weapon to do it with, but nowhere near the best. Crowd Control: Kills with this weapon grant bonus damage for a short time. 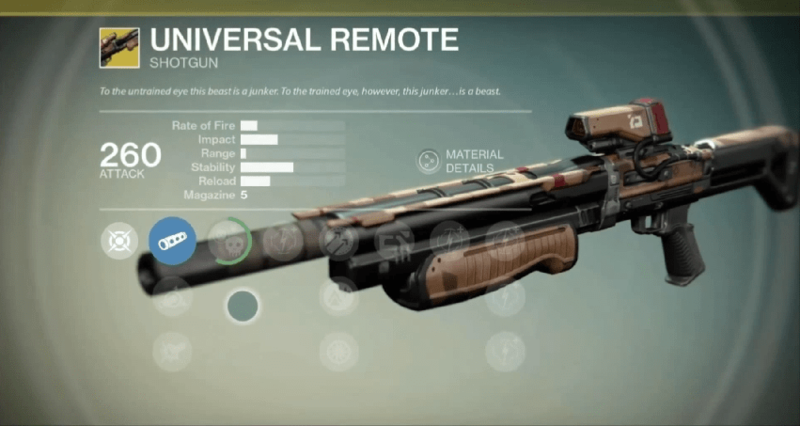 Universal Remote: Range and precision damage increases greatly while aiming down the sights. Everyone knows Titan’s like to punch things, and the quicker you can do that, the better. These perks are useful in PvE as well as PvP. If you’re a Defender, and don’t have any Defender-specific Exotics (such as Helm of Saint-14), then pick these up. These have an OK roll of 89/96 Strength, more than the last time it was sold. Rain Blows – Increases melee attack speed. Improved Disintegrate – Increases the duration of Force Barrier. With No Backup Plans, your melee strikes can fortify you with a Force Barrier, giving you extra durability in combat. Special Weapon Loader reduces your reload speed by about .7 seconds. With Rain Blows you are going to have an increased melee attack so when you run into multiple enemies, these gauntlets can help you make quick work of them. Because they’ll give you Strength, you’ll get a boost to durability, as the increased chances to trigger Force Barrier can greatly improve your staying power in combat. The obvious benefit of these is that you can stay protected for longer; it’ll increase the duration to about 20 seconds (from 15 seconds). 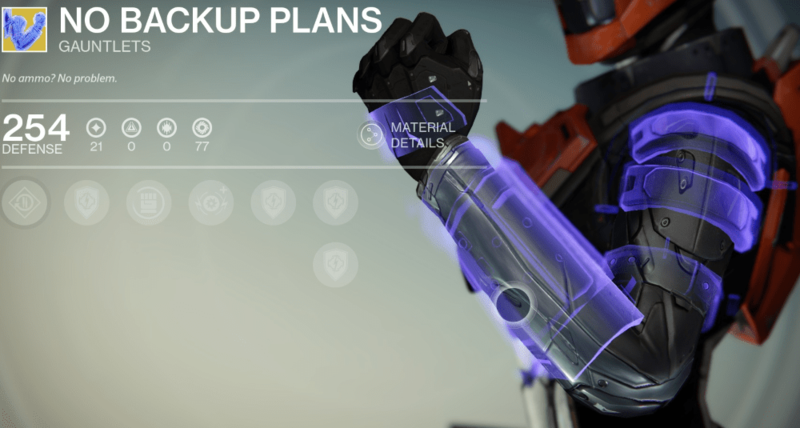 These are very well rounded gauntlets and are worth picking up. Another brand new item in Xur’s inventory, this helm’s key ability will enhance the zoom of your Golden Gun, allowing you to get more precision shots. For those that don’t know, the Golden Gun does more damage with precision shots. Consider buying an Exotic Helm Engram and you may even get this helm or something better. With the latest patch, even the Golden Gun suffered a bit from the hand cannon nerfs (bug? ), so Arachnid Sensorium may help alleviate that. This helm comes with 44/47 Discipline and 44/47 Strength, very low rolls. The Golden Gun is already accurate when aiming down sights, and the enhanced zoom from the ATS/8 ARACHNID cuts down your field of view further, and isn’t really necessary or useful in most situations. The other perks on the helm work well, revolving around your grenades, allowing you to use your Super and melee ability more often. Having your throwing knife and Super available more often is great, but it’s going to be more apparent in PvE, since damaging/killing non-players with grenades will be much easier. Unfortunately the enhanced zoom is very lackluster and the helm is arguably a waste of coins. Another first-timer! 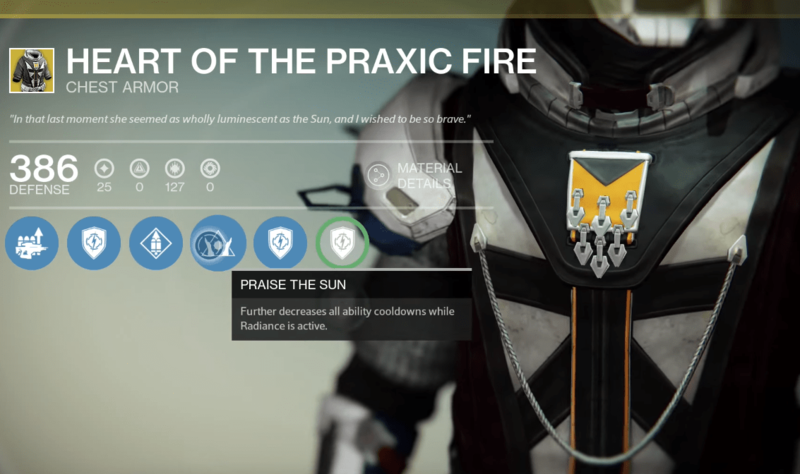 Heart of the Praxic Fire is specific for Sunsinger’s, as it requires Radiance to take advantage of Praise the Sun. This chest has a low stat roll of only 129/139 Discipline, while the maximum could reach up to 170. With the right skills selected, you can become an infinite grenade/scorch machine when Radiance is active. Which grenade type to use is really a personal preference, but the ability to completely deny areas with Solar grenades while using this armor is very useful in both PvP & PvE. Add Flame Shield, Radiant Will, and Gift of the Sun to really give you an edge. Heart of the Praxic Fire is excellent in PvE for taking out large numbers of enemies very quickly. It can also be very useful in PvP is your play still is to get up close and personal with the help of Scorch and grenades. If you’re with another Sunsinger with this chest, Praise the Sun is affected by other Sunsingers’ Song of Flame, so at least one of you will want to be using that talent.